If you’re one of the fortunate few who have some outdoor space with your condo, are you using it to its full potential? 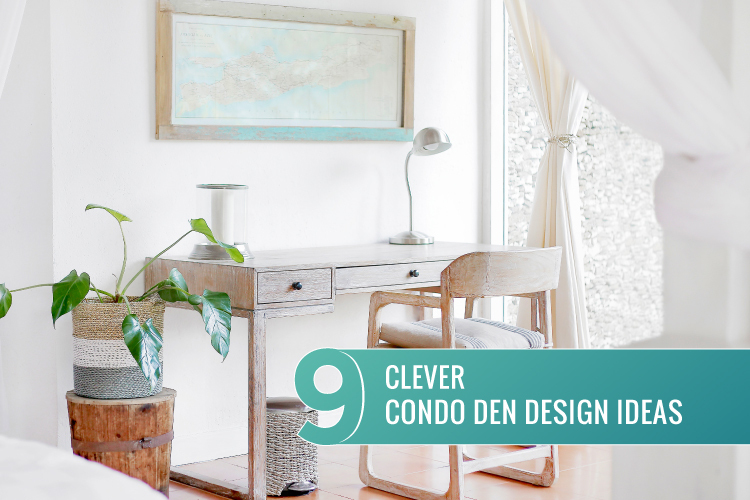 We’ve got all the tips and ideas you need to make the most of your condo balcony. 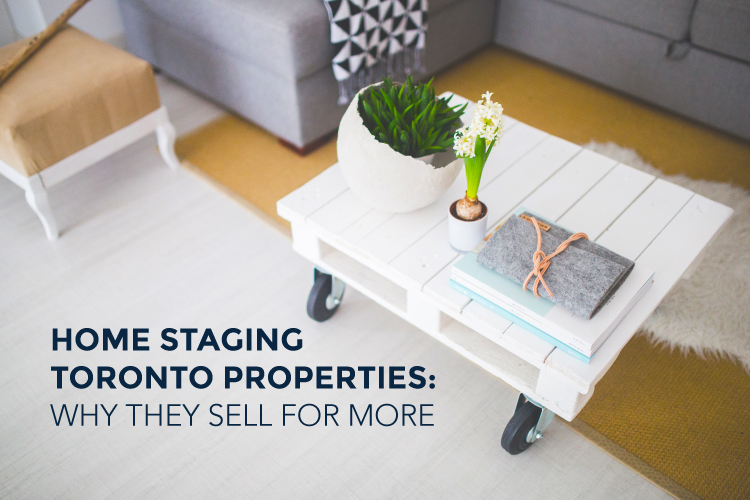 When you live in a city like Toronto, chances are you find yourself either renting or owning a Toronto condo. If you’re fortunate enough to get a bit of private outdoor space with your condo, the question is: are you maximizing its potential or does it simply exist unused? 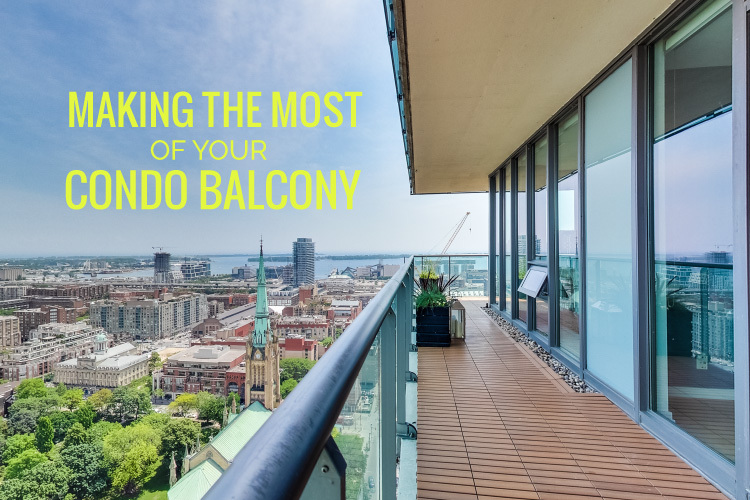 Whether you have a small balcony or a spacious terrace, here are great ideas to ensure you’re making the most of your condo balcony so that you can live your best condo life. HOW WILL YOU USE YOUR CONDO BALCONY? First, ask yourself what type of outdoor space you want to create. Do you want a place where you can sit and have your morning coffee and evening cocktail or do you want a place to cozy up with a good book? Are you a home cook that loves using fresh herbs and veggies or maybe you’re just itching to have some flowers to add some life to your home in the sky? Once you’ve decided how you wish to use the space, then you can start designing it. Are you in an area that gets a lot of rainfall? Is it overly windy on your balcony? Do you get a lot of direct sunlight? 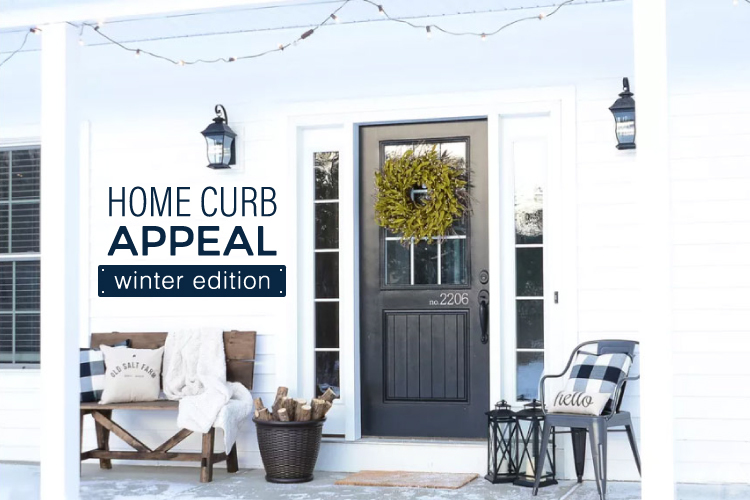 Will your furniture be out there year-round even during winter months? You’ll notice that teak and synthetic resin are the top contenders when it comes to outdoor furniture. Both have very different styles so you’ll want to determine the look you’re going for. Wayfair has a great patio furniture guide with all the details and care tips for different types of outdoor furniture. 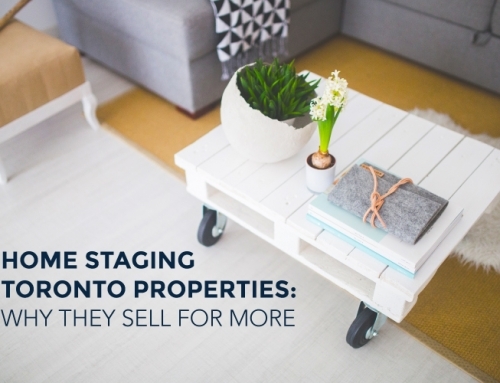 The next step is establishing a colour palette for your condo balcony. You’ll want to select one or two colours to accessorize with. 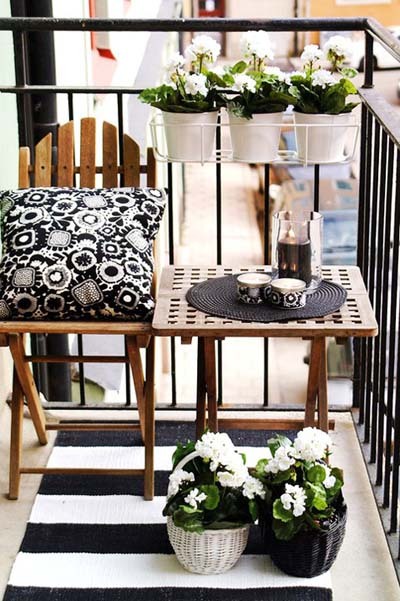 Pillows, blankets, potted plants, and even the furniture itself will factor in when styling your balcony’s aesthetic. One thing that can really enhance the vibe of your condo balcony or terrace is outfitting the floor. Most balconies come with plain ol’ concrete which is hardly inviting. Wooden tiles instantly make your condo balcony feel like a deck, adding warmth and a softer place for your feet. For those smaller balconies, throw down an attractive rug or even a straw mat for a simple alternative to the concrete ground. If having green space is your cup of tea, look for a good quality artificial grass mat — just make sure it doesn’t look too cheap. For those who want a cozy oasis where they can really hunker down and relax, a cozy bench covered in cushions is the way to go. If you’re a DIYer, use a palette and some cushions to create your outdoor sofa. The more fluff you can add — along with a nice throw — the better. If your balcony can support it, hammocks are always an amazing way to lounge without occupying too much balcony real estate. Not all balconies are created equal. For those of you who don’t have a lot of space to work with there are a few simple ways to maximize the space you do have. Your balcony railing is a perfect place for hanging just about anything. 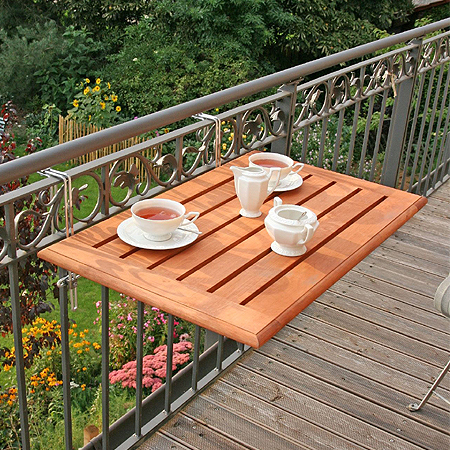 Look for collapsable tables that can be mounted to your railing and can be propped up only when you need them. They can serve as a desk for your laptop or a kitchen table for your breakfast. Similarly, look for benches that have built-in storage to house your cushions and blankets when you’re not using them. 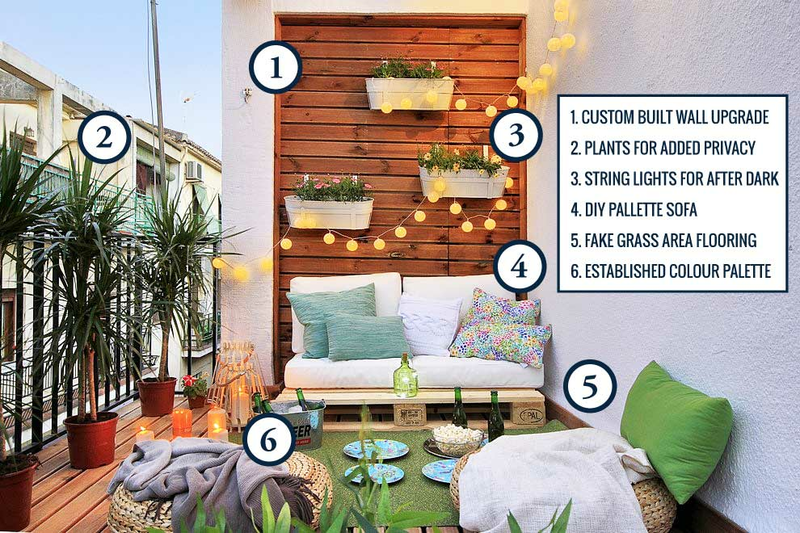 When you’re living in a concrete jungle, adding some flora to your condo balcony is a great way to bring some life to your space and there are lots of different ways you can use plants on your balcony. Some use it as a means of creating privacy between their neighbours while others may choose to grow their own vegetable gardens. Just because you don’t have a proper garden doesn’t mean you can’t grow some veg. Check out this list of vegetables that are great for balcony gardens. Even on a small condo balcony you can use planters that can hang from your balcony railing and don’t take up too much space. If you’re blessed with a large balcony, potted plants and planters make for great accents throughout your outdoor oasis. Check out this item from IKEA that serves as a bench and a place to hang plants and other decorative accents. Once you’ve got your outdoor space furnished and decorated, the final step is to add some light. 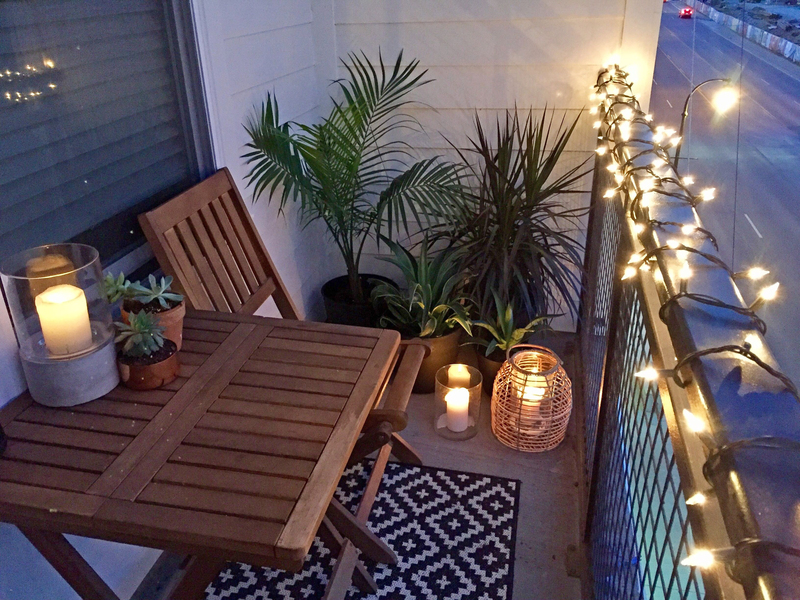 String lights are always a popular way to add light to your balcony without overdoing it. Votives or lanterns with candles are a great alternative or addition to set the mood for those warm nights spent in your outdoor oasis. With all these tips and tricks it can be a lot to envision. 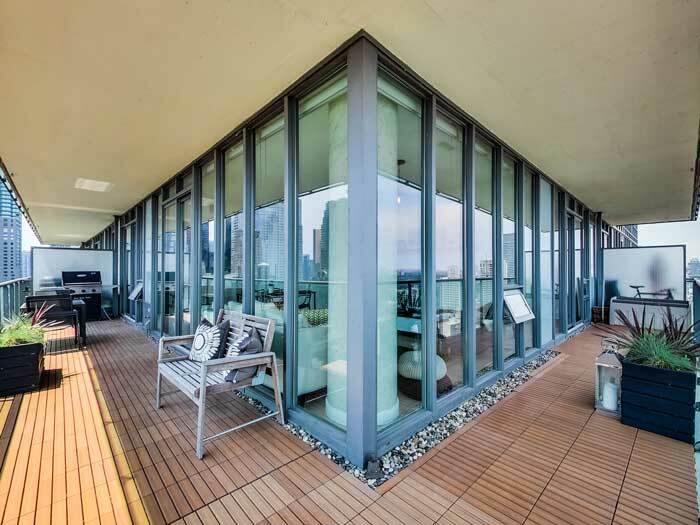 Look at this beautifully designed condo balcony from topbalconys.com for some great inspiration and how they used some of the ideas we discussed in this blog.